Should Your Town Ban the Sale of Plastic Water Bottles? is a great first unit to try in an elementary classroom. This interdisciplinary argumentative prompt is a real-world topic and it is accessible because most students already have some background knowledge about plastics. 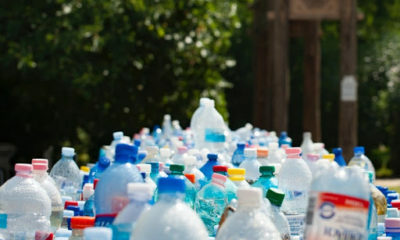 Chances are, there might be some plastic water bottles lying around in their own homes and classrooms. Three of the four documents in this unit are graphs and charts. 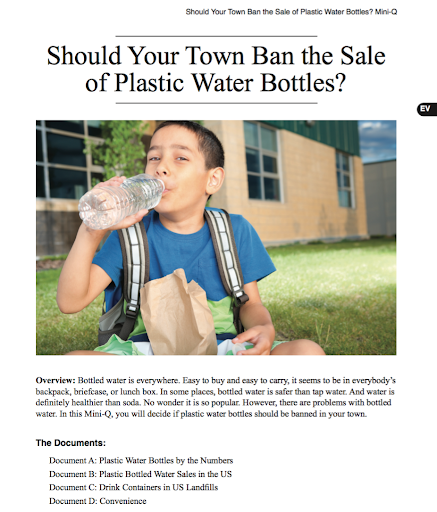 In document A, students discover how many water bottles are consumed, the cost of consumption, and recycling statistics. Document B opens the students’ eyes to the trends in water bottle sales. When students analyze Document C, they will realize that glass and other types of beverage containers weigh the most in landfills. Document D is a textual document that summarizes the convenience of water bottles and raises compelling questions to help students dig deeper into this topic. Ample evidence can be found to support both banning and not banning the sale of water bottles in this unit. Ultimately, students have to take a position and use evidence to support their own claims. This and the other lessons in our Elementary-Q binder are aimed at students in grades 3-5 and are available in three versions. In addition to the Clean and Enhanced Versions found in our other Mini-Q binders, teachers have the shorter Micro-Q option that has a more guided Background Essay and only one document. This format allows teachers to emphasize the annotating, thinking, and writing skills needed to do a longer Mini-Q. Using whichever format is most appropriate, this lesson provides teachers a perfect opportunity to let students engage in an important civic debate. Students build skills while they work to resolve an important issue using science, statistics, discussion, and writing.